Livni tells her party that deal with Netanyahu will allow Hatnua to push its own views of diplomacy, prevent “extreme” government. 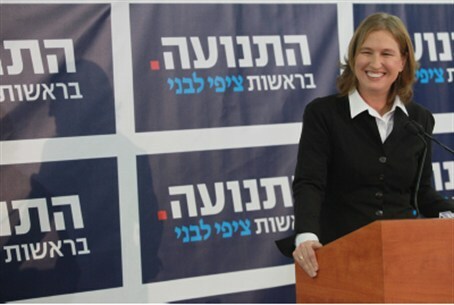 Tzipi Livni spoke to her party, Hatnua, on Wednesday, less than one day after the party officially joined Prime Minister Binyamin Netanyahu’s coalition. “Entering the coalition will allow us to promote our views regarding the promotion of the peace process,” Livni declared during a faction meeting. Hatnua will also help prevent “the extremism we saw in the last Knesset,” she added. Livni said changes to the political map justified Hatnua’s participation in the coalition despite her refusal as the head of Kadima in the last Knesset to join Netanyahu. Responding to criticism of her decision to join the government, she said, “It was obvious that there would be criticism, and that is legitimate, but the real test will come in the future.” Livni was criticized for joining Netanyahu after years of condemning his policies as extremist and harmful. Livni did not take questions from reporters following her address. A brief incident at the beginning of the Hatnua faction meeting appeared to indicate tension within the party over the new coalition deal. MK Amir Peretz extended his hand to MK Amram Mitzna, who rebuffed it – possibly due to an argument over which of the two will take the second ministerial post offered to the party.